I have always wanted to be successful, that was my aim. I love to cook, and I love fashion, so I thought to become a fashion designer and a restaurateur. But how much can you do with so little money? Sad! But guess what I did, I prayed. Yes, I prayed so hard I said God please I am begging you show me a sign, I am tired and hopeless I need a breakthrough. What we fail to realise is that sometimes our problems are so hard we believe that we have the worse life and going through the worst situations. But there is always someone who is worse off than you, trust me. One day while searching Pinterest which I had no idea how to use, I discovered blogging. I believe it was a pin from Chasing Foxes on how shoe used blogging to make thousands. It took me couple days to finally say I am just gonna shut my eyes and pay for my domain and hosting from HOSTGATOR, luckily I got a ridiculous discount and ended paying only $36 for everything. They keep you updated and with 24hr customer service. They offer great help with SEOs and ways to maximise your potential. They do provide an affiliate program so you can definitely make money with Hostgator by recommending a friend. This is my 3rd-month Blogging, Yippy! I am currently around 40,000-page view for February; my page views increase drastically. However, what I did wrong was to focus on pageviews rather than monetizing my blog. Seeing now that I have mastered how to increase my page views now my primary focus is getting more income from my blog. My goal is to make $500 by April. Let us see if I can accomplish this aim. 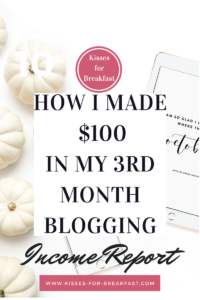 When I published my post on How I went from 0 to 14,000 page views overnight, I said my goal was to get 30,000 page views in my 6th month blogging. Just like that, I got it and more in one month. Nothing is Impossible. I happen to believe in miracles and you should too lol. I found my passion, I love blogging, and I will be definitely making this my career goal. I have so many plans for my blog, and I am just too excited. This is the beginning of my journey. Even if I don’t make as much I am still fulfilled.